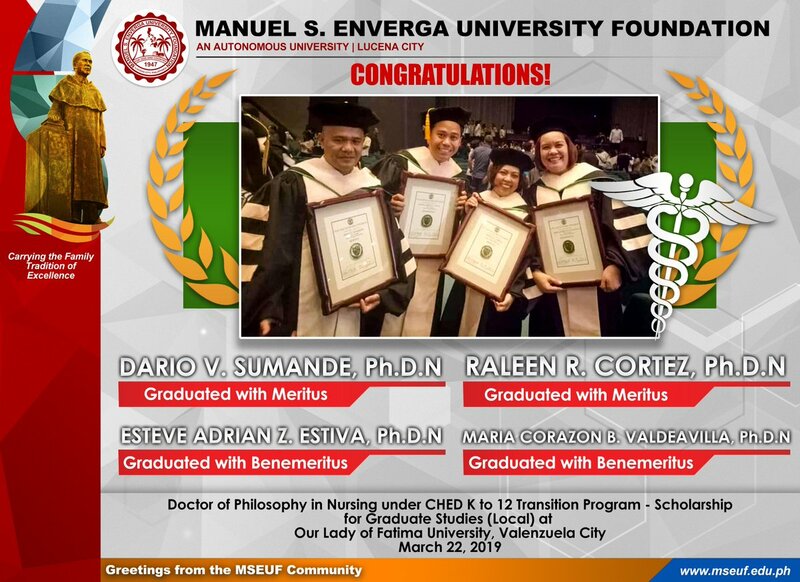 Enverga University or also known as Manuel S. Enverga University Foundation or MSEUF, is a private, non-sectarian research university, which is situated mainly in Lucena City. It has satellite campuses in Candelaria, Catanauan, Sampaloc, and San Antonio, which are located in the province of Quezon, Philippines. The university is named after to its founder, Atty. Manuel S. Enverga. Enverga University also has the second highest number of accredited academic college degrees/programs offered in the whole Southern Tagalog Region, behind University of the Philippines Los Banos. Manuel S. Enverga University Foundation is feeling proud with Ronn Aldwin Muñoz and 4 others. Congratulations to our fellow CME Envergans and to Prof. Jahzeel L. Sarmiento for bagging the 2nd Best Conference Paper in the recent event "Development and Validation of Shipboard Training Manual: Guide for Cadets in Finishing Bachelor of Science in Marine Engineering And Marine Transportation Programs". Congratulations to our 2019 Registered Electronics Engineers & Technician! Envergans! 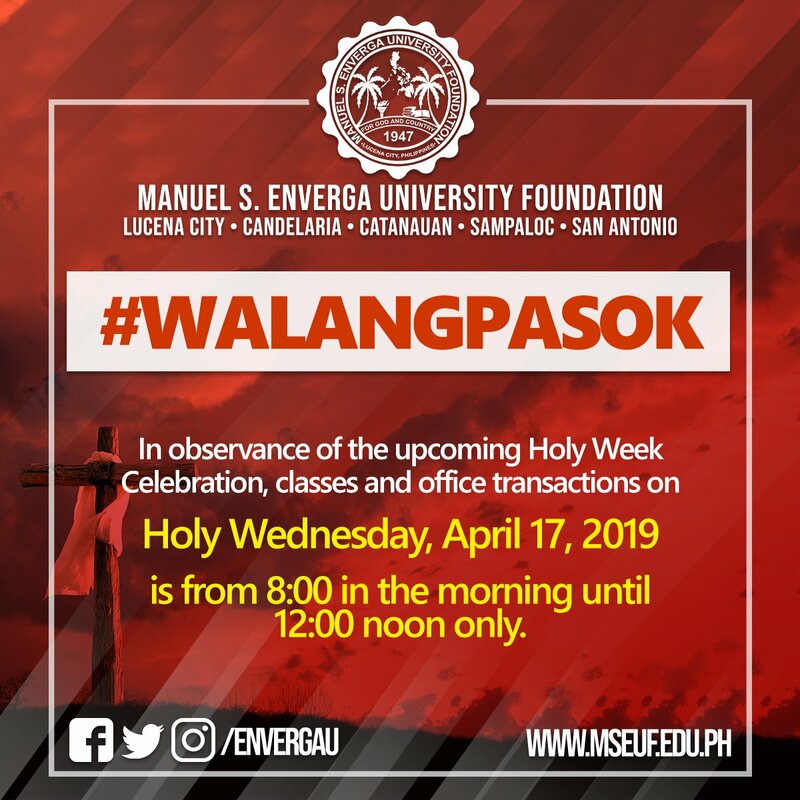 In observance of the upcoming Holy Week Celebration, classes and office transactions on Holy Wednesday, April 17, 2019 is from 8:00 in the morning until 12:00 noon only. ⚠Note: Only the mobile number of the guardian, in association with the student number, is allowed to check the student's tuition fee balance. Enrollment starts on May 6, 2019. Classes begin on July 1, 2019. #Envergans! 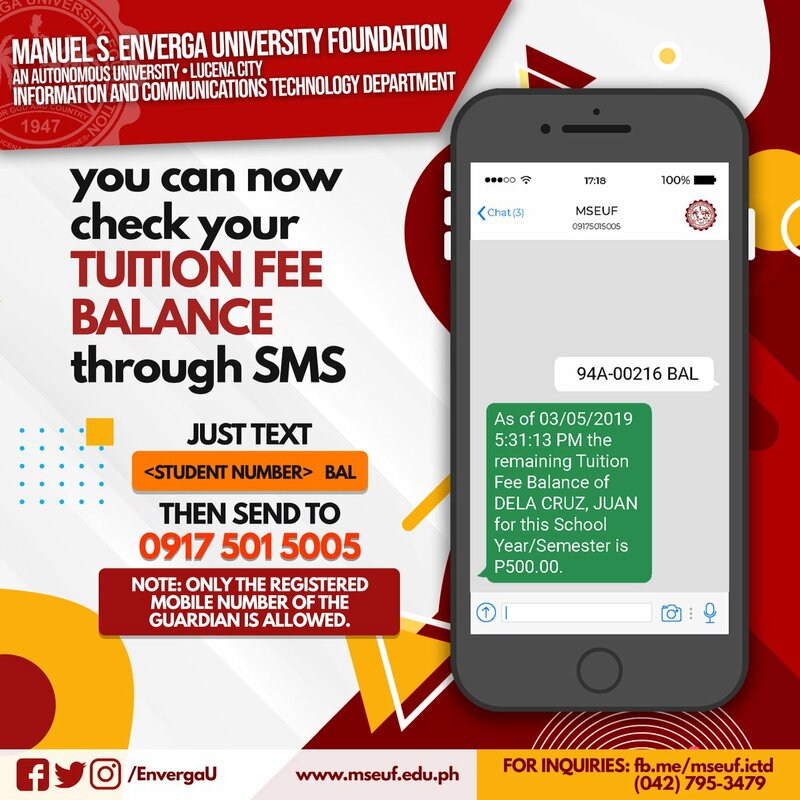 You can now check your Tuition Fee Balance through SMS! ⚠Note: Only the mobile number of the guardian is allowed to check the student's tuition fee balance. Enrollment starts on May 27, 2019. Classes begin on June 10, 2019. To apply to Manuel S. Enverga University Foundation-Lucena course programs, applicants should be Graduates of foreign and Philippine high schools accredited by the Department of Education (DepEd) may be admitted as freshmen into the University. 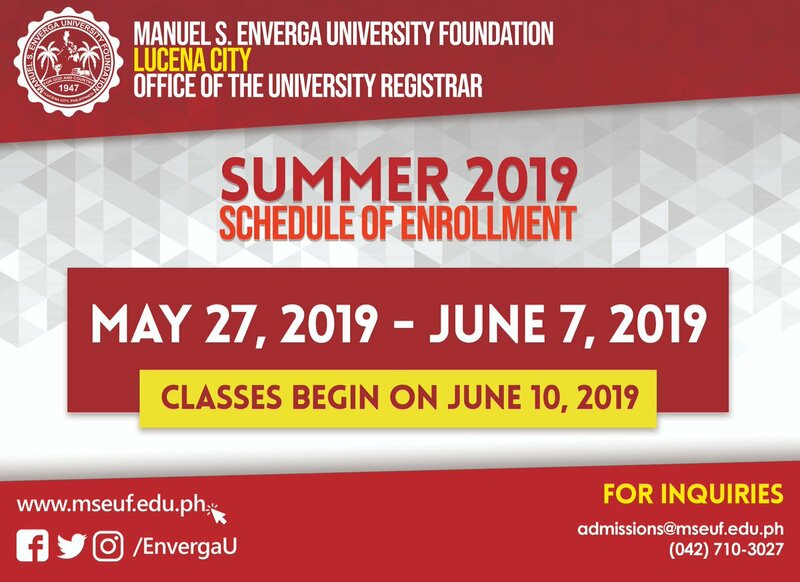 Transfer applicants seeking transfer admission to Manuel S. Enverga University Foundation-Lucena have to satisfy the requirements of as well as those of the college/ degree program to which they seek to transfer. Payment of foreign service fee upon acceptance and every semester thereafter.